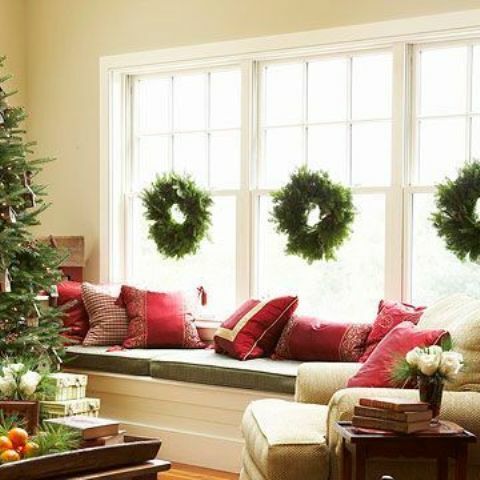 Decorating for Christmas don’t forget about some particular pieces like a mantel, doors and windows. 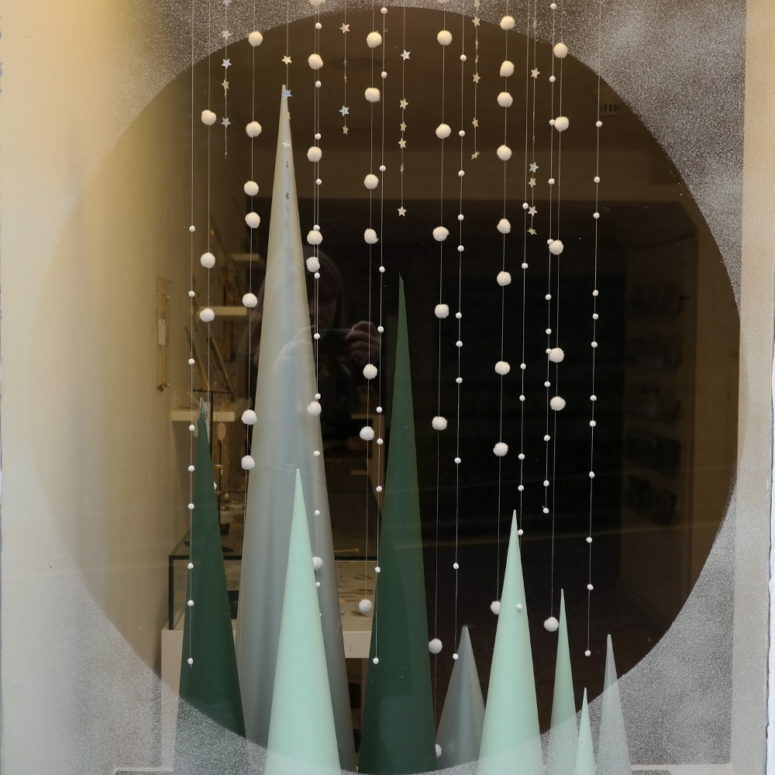 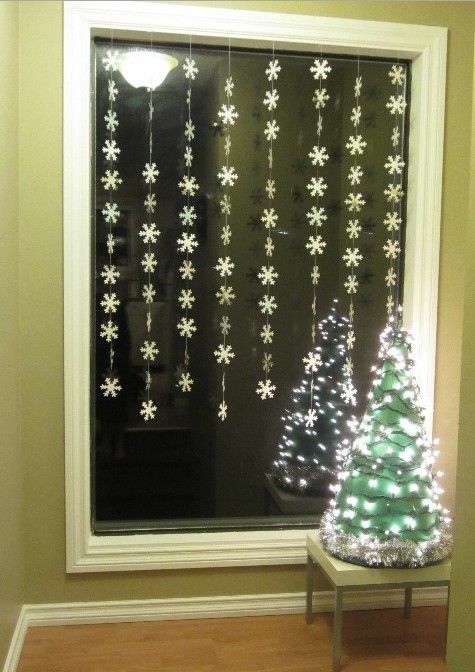 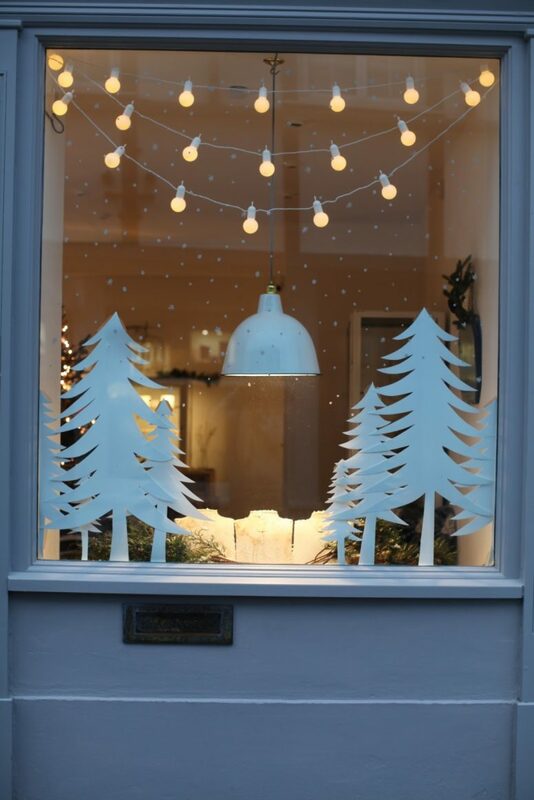 Let’s see how you can decorate the windows in your home for Christmas. 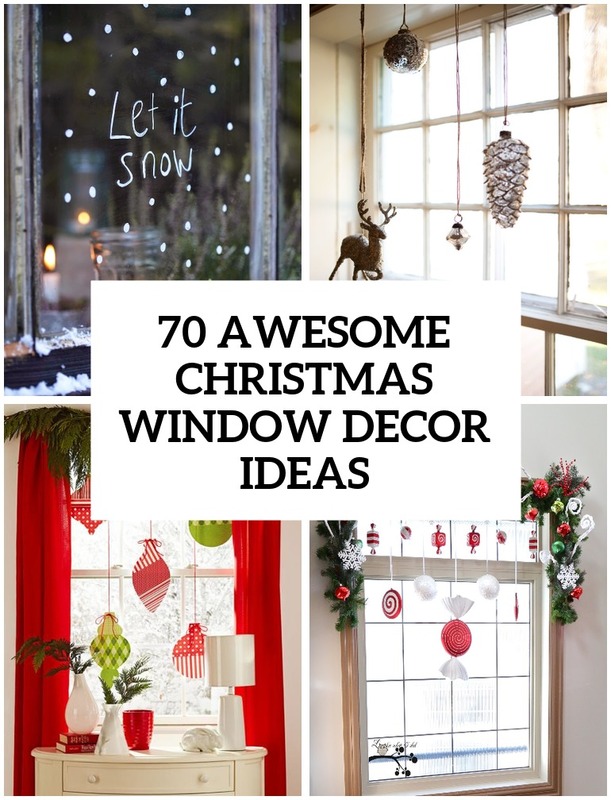 There are so many ideas and styles to choose! 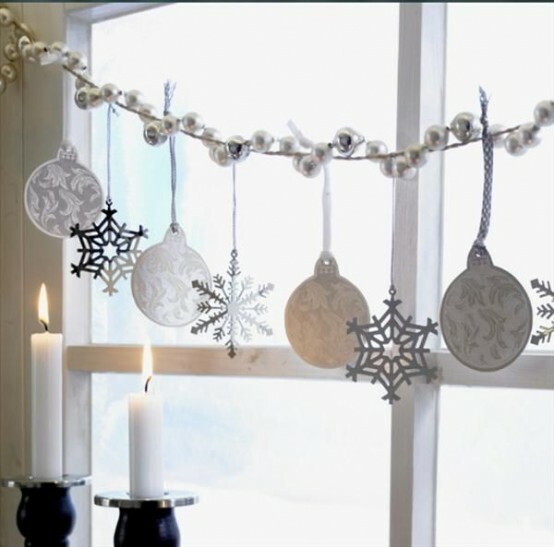 Hanging wreaths, ornaments, pinecones, gifts, advent calendars, even cookies – you can hang almost everything you want to! 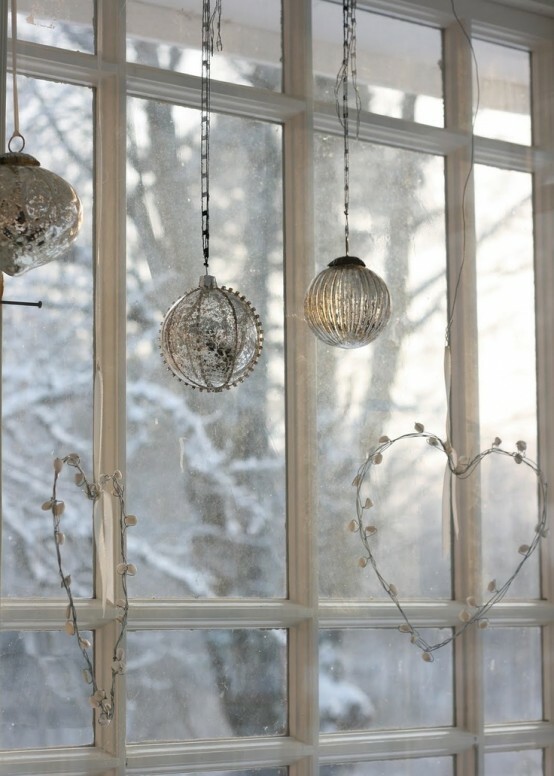 Lights are a very cool and kid of romantic idea – it’s suitable for every window and great even after the holidays. 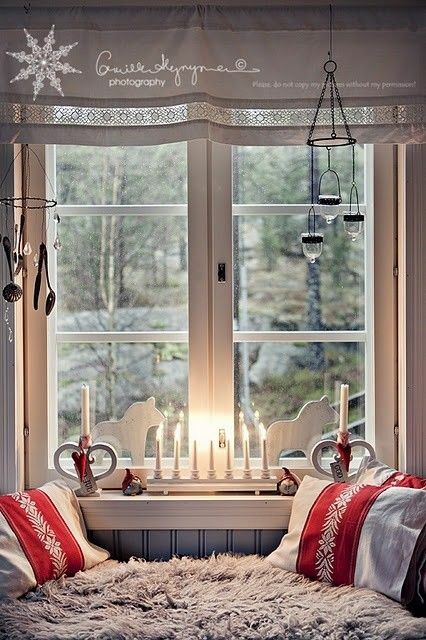 If you don’t want to hang anything, decorate the window sill then. 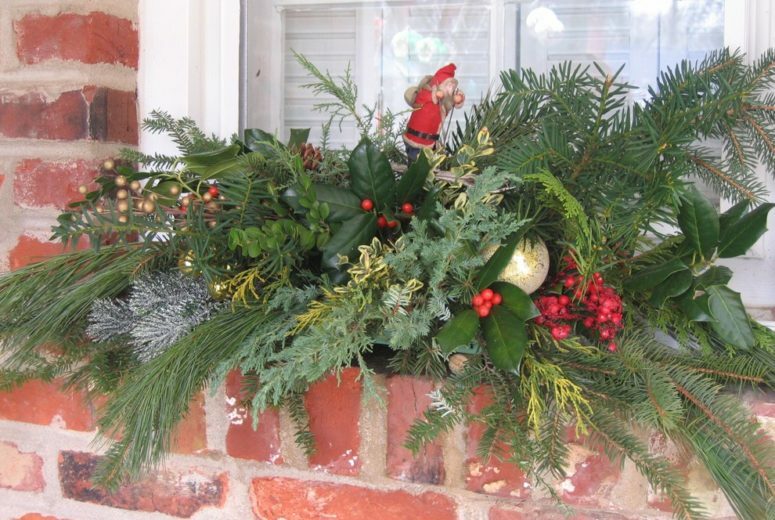 Put evergreen plants, pinecones, branches in bottles or vases, some figures or even a small Christmas tree. 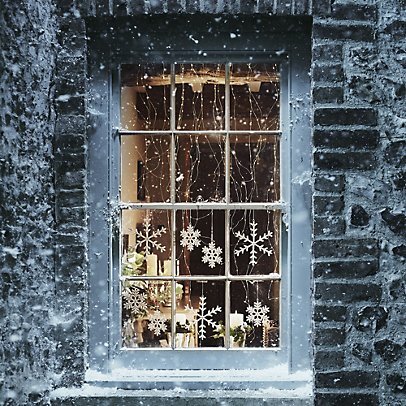 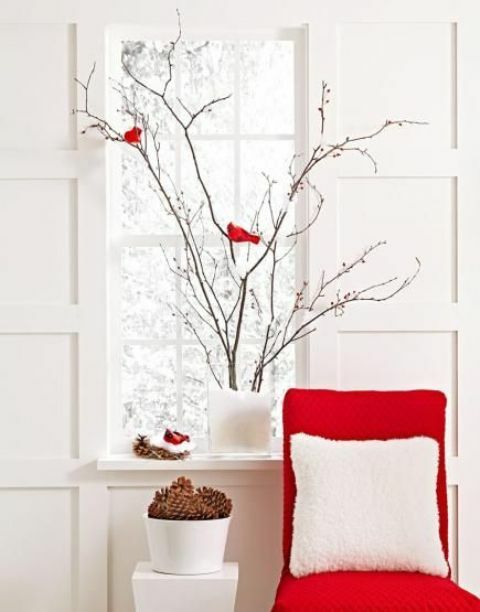 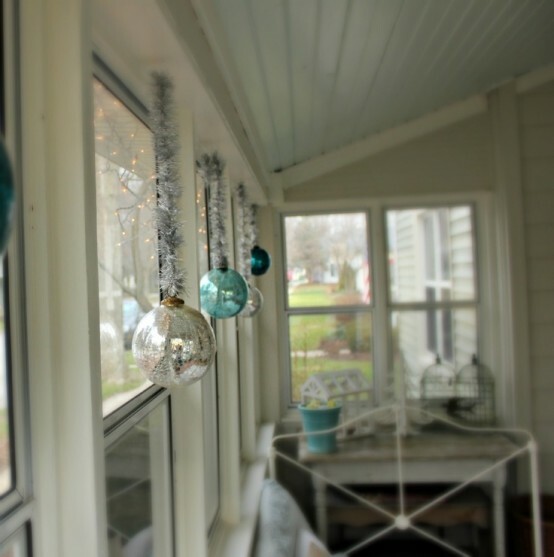 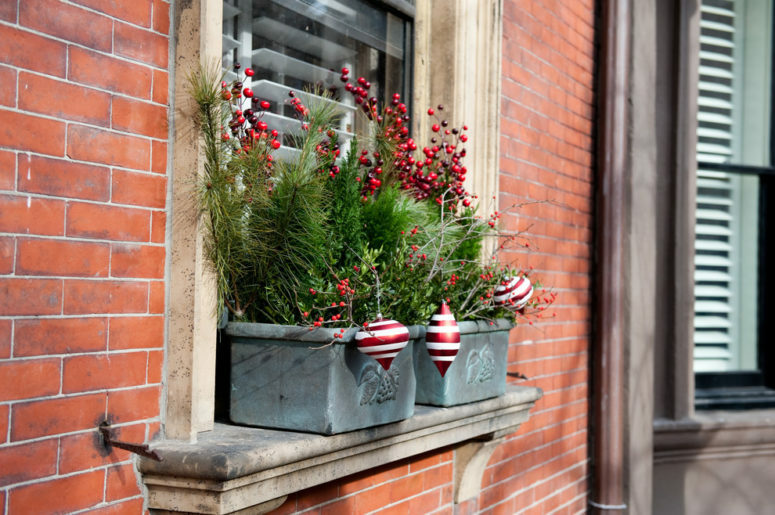 Enjoy various window décor ideas below and start decorating for the holidays! 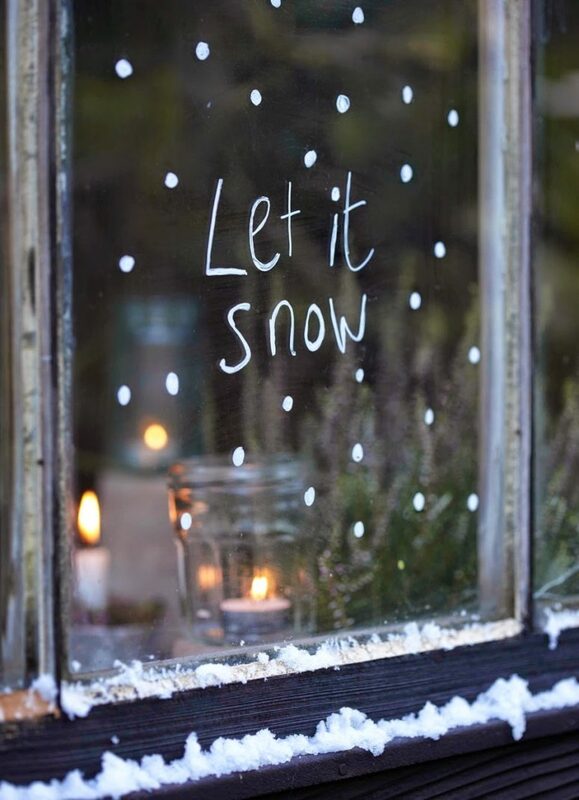 Use a white marker to draw and write something cool right on a window. 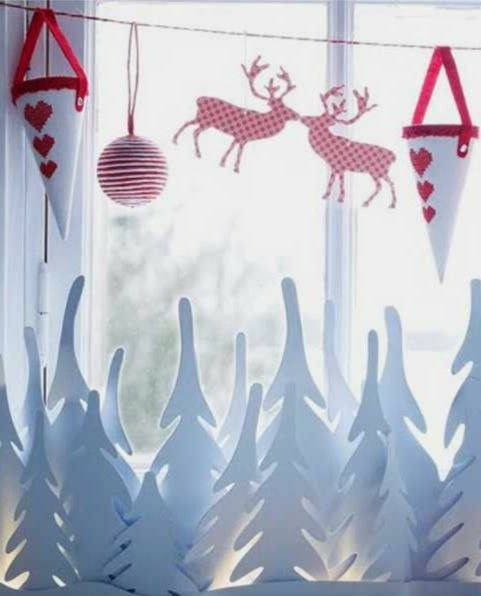 Make some oversized Christmas ornaments from craft paper to make your window's decor visible from outside. 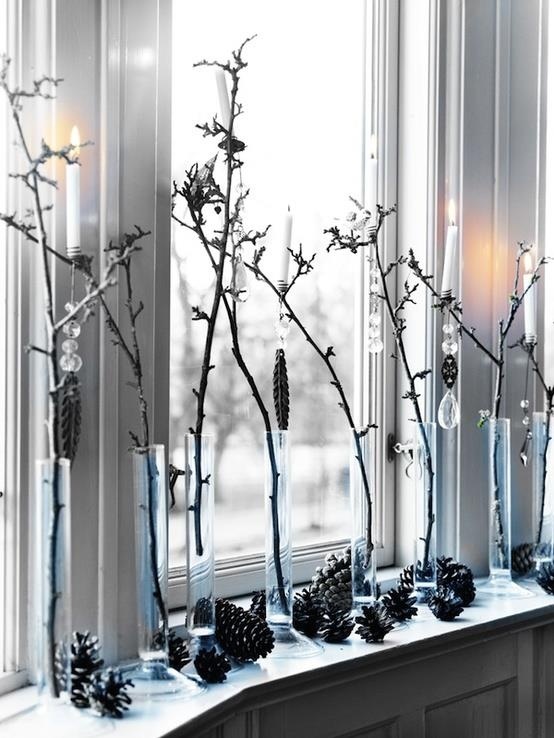 If you have a bunch of cool vases put some tree branches in them. 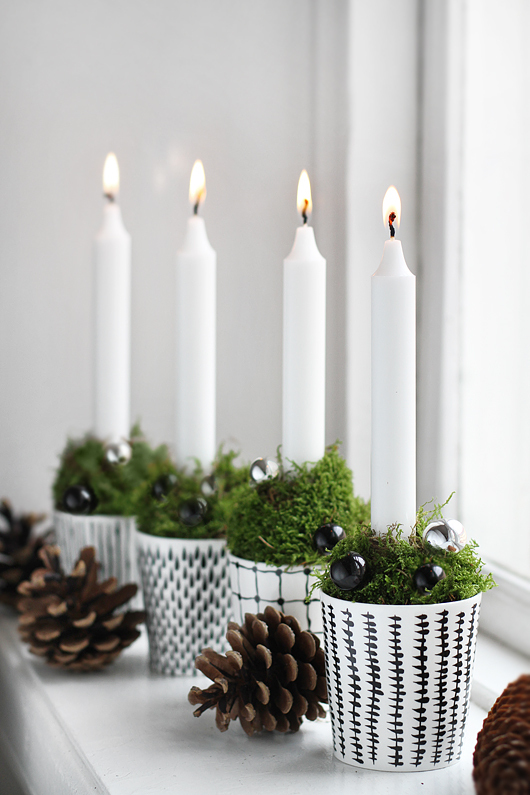 Surround these vases with pinecones, add some candles and you got yourself a beautiful Christmas arrangement. 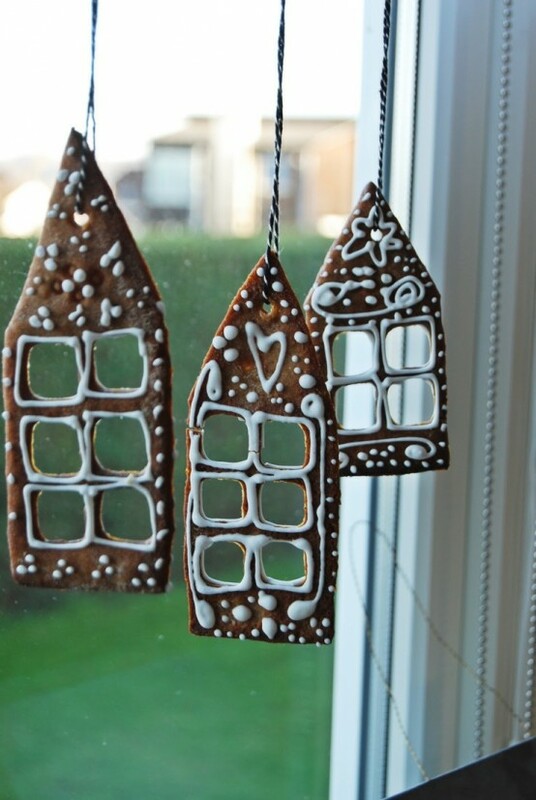 Two-dimensional gingerbread houses would add a cozy and fun touch to your window's decor. 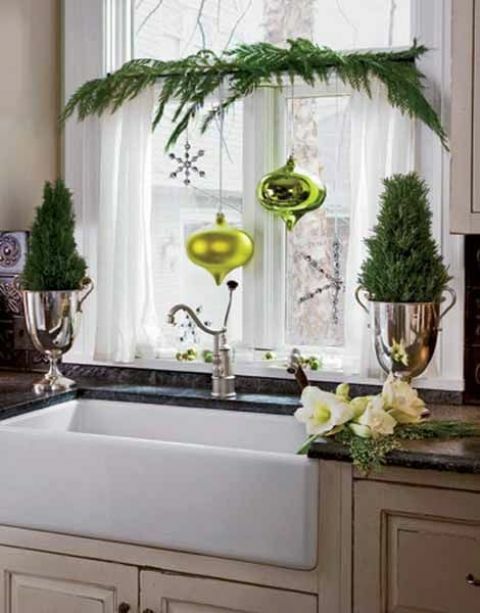 A bunch of faux tabletop evergreens in different sizes would make a perfect windowsill's display. 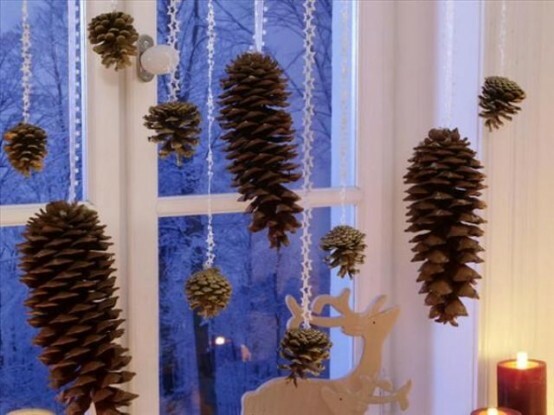 Add little ornaments to pinecones to make them look even cooler than they are. 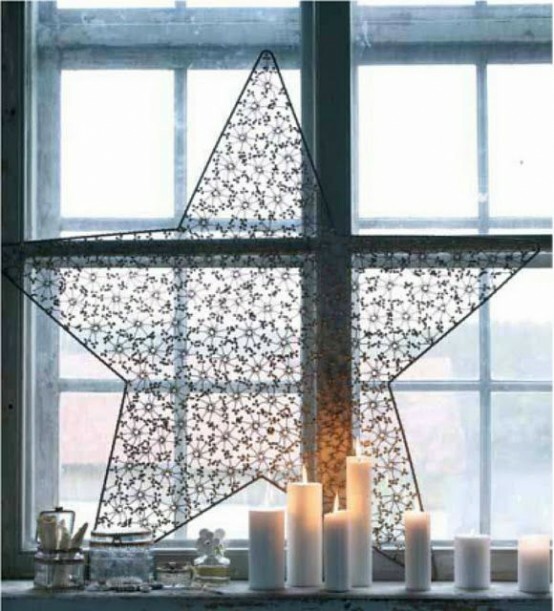 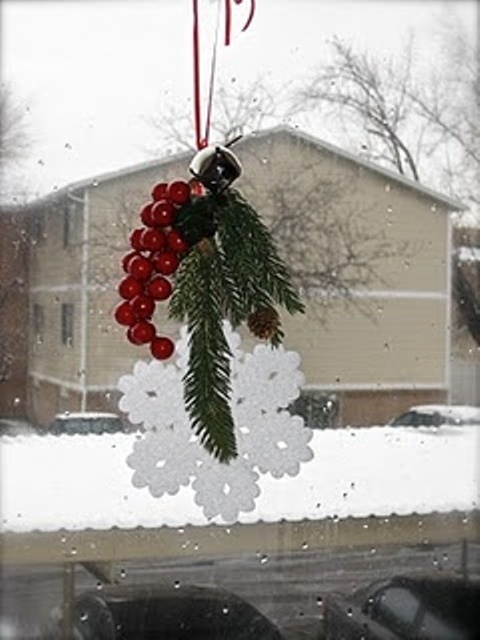 Snowflakes cut of paper is the cheapest way to decorate your windows and a really cool craft project for kids. 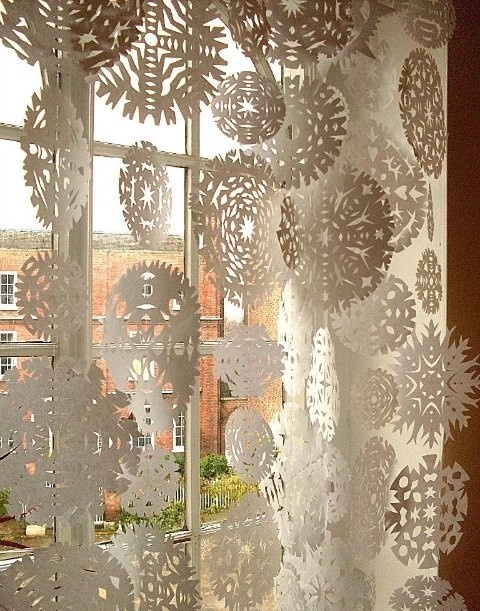 We all know how easy it is to cut paper snowflakes. 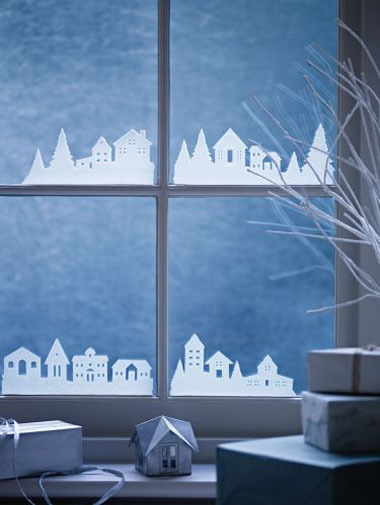 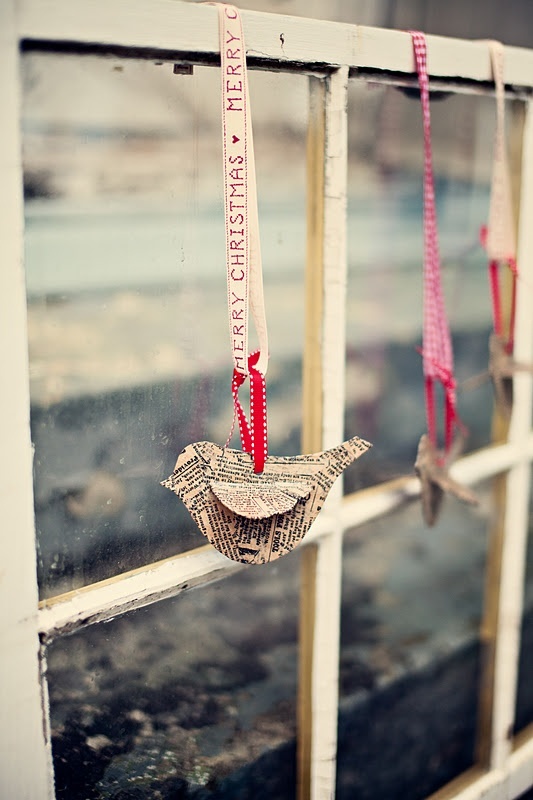 Although there are lots of other interesting things you could cut from paper for your Christmas decor. 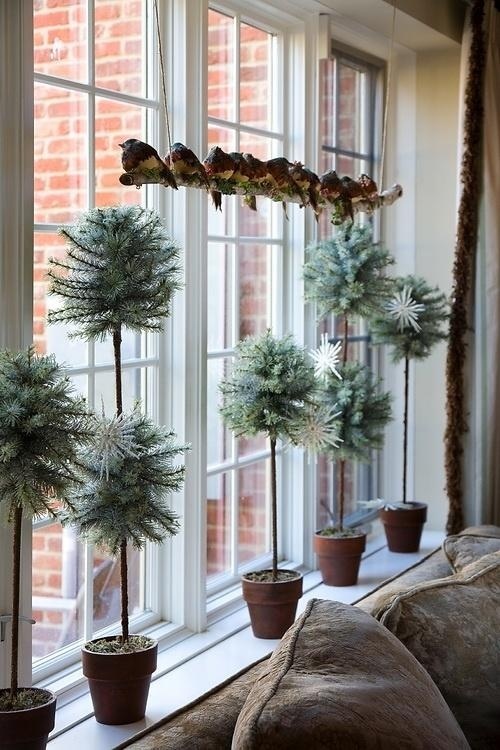 For example, a whole evergreen forest you could put on your windowsill. 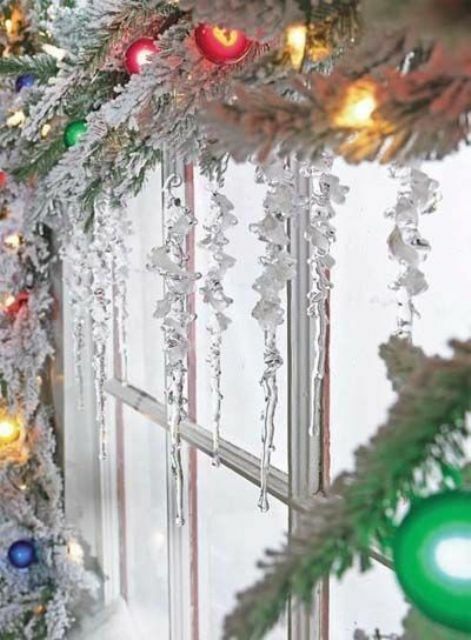 Several lights hidden in it would make it looks even cooler. 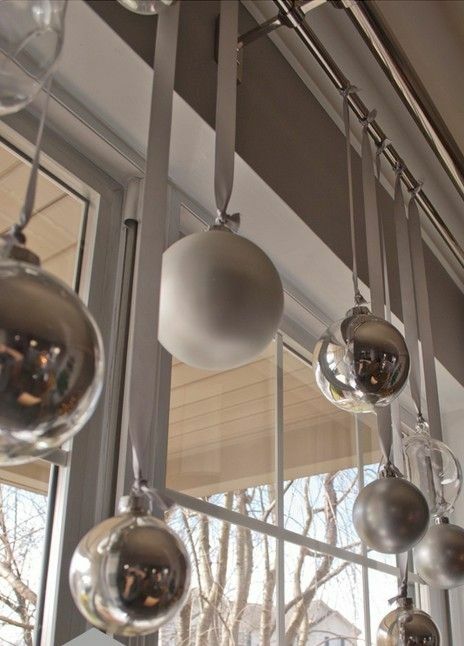 Transparent glass ornaments hung in windows will catch light and send reflections throughout the room. 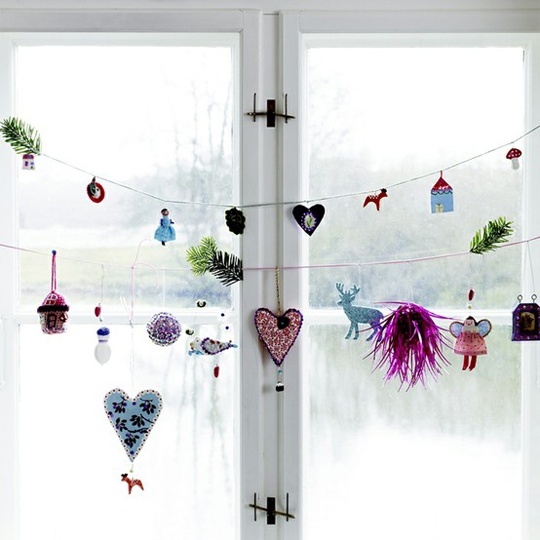 Here is a cool idea for a craft project for your kids - a garland made of little toys and Christmas figures. 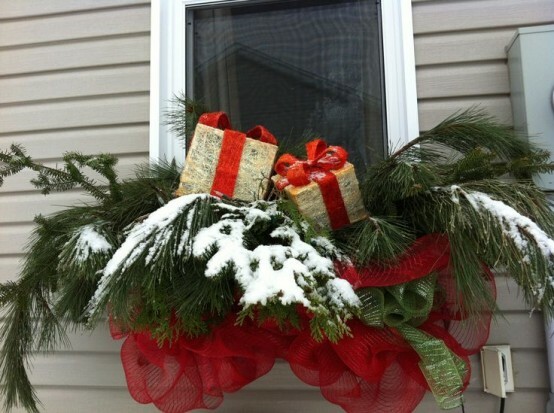 Evergreens and red ribbon are only things you need for great Christmas decor. 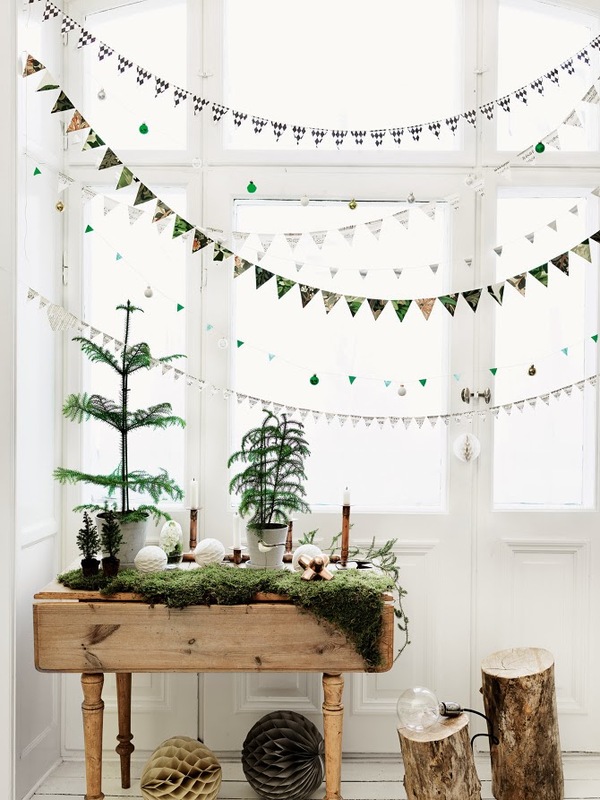 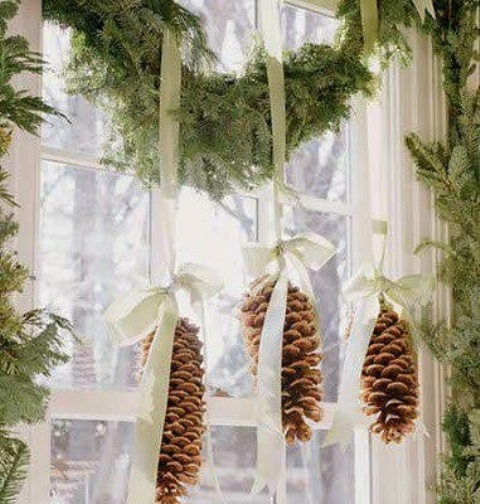 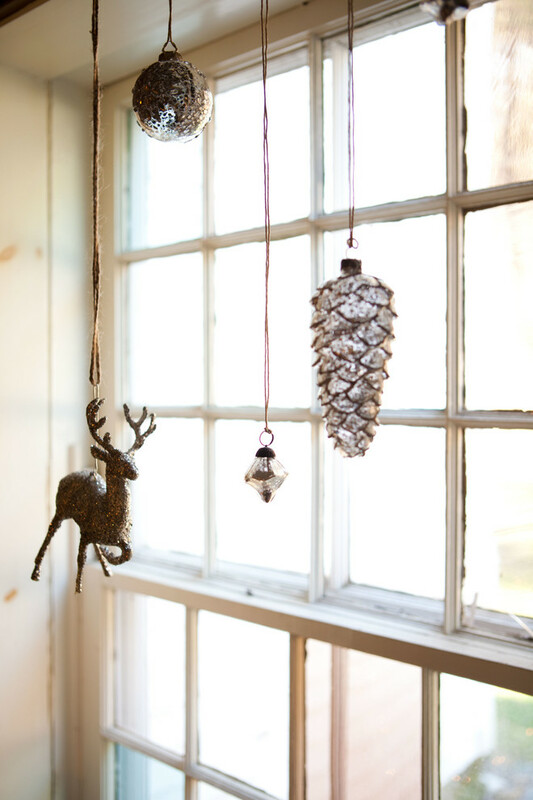 Here is a cool idea if you like want to hang a pinecone garland on your window. 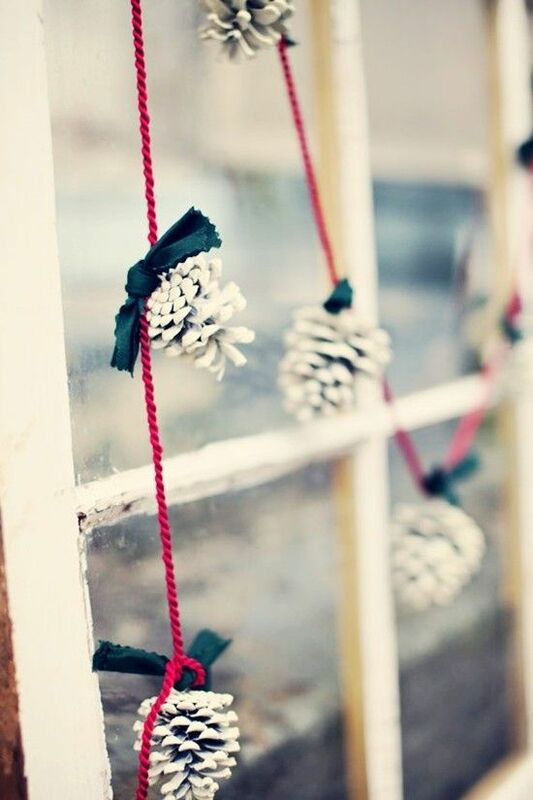 Add a personal touch to it by painting pinecones in white and adding black ribbon scraps to them. 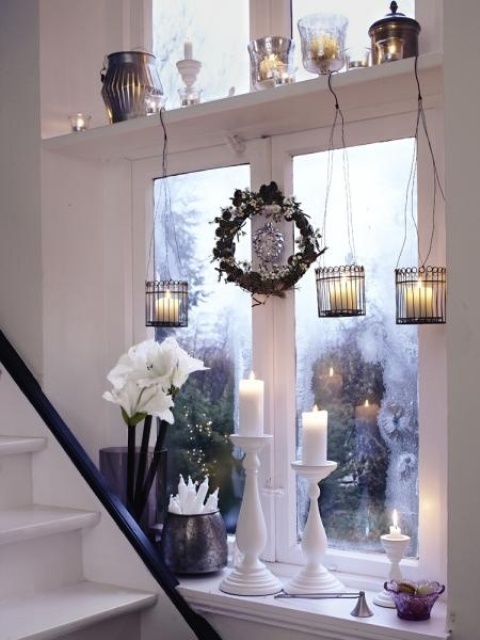 It's a great solution if you like black and white color scheme for Christmas. 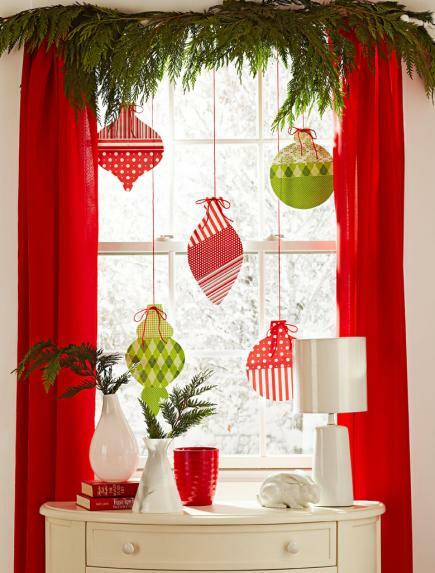 Simply hang a bunch of evergreen wreaths to the curtain's rod with red ribbon. 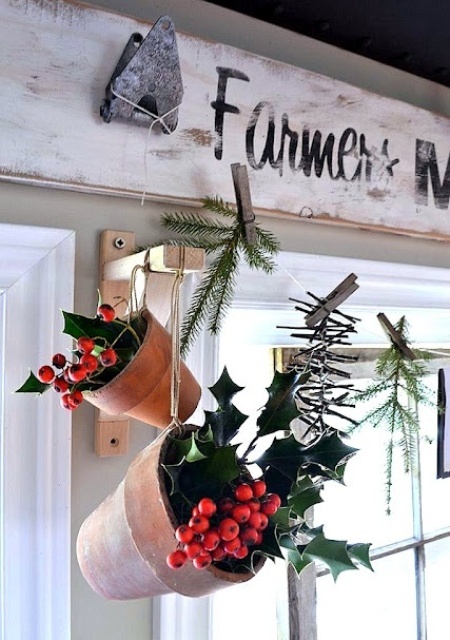 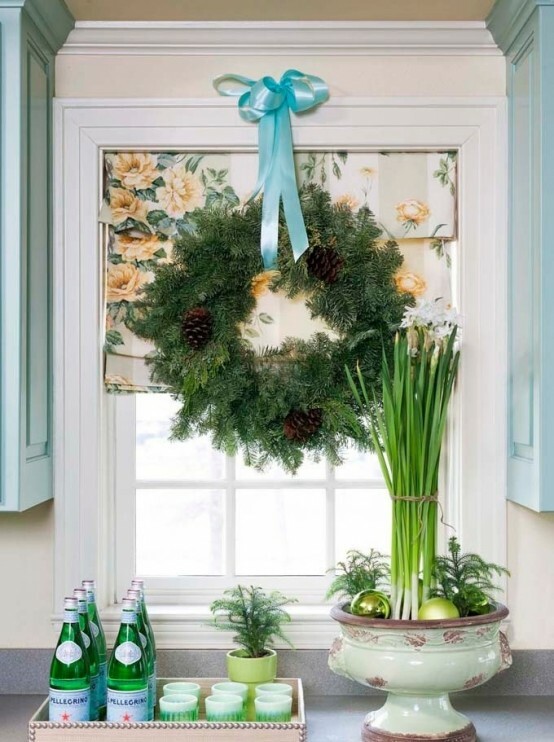 Make an outdoor window holiday swag using floral wire to fix things up. 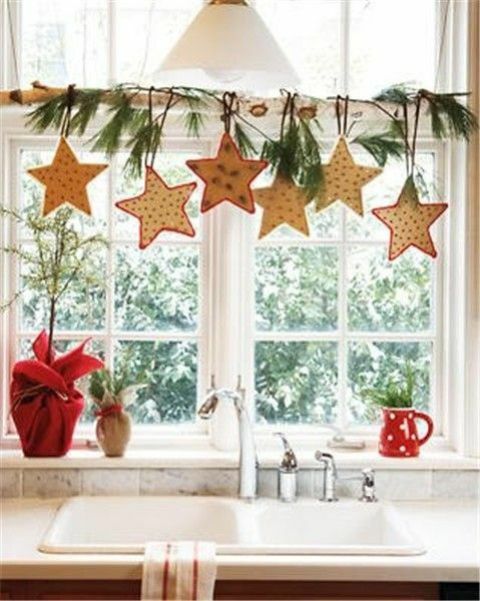 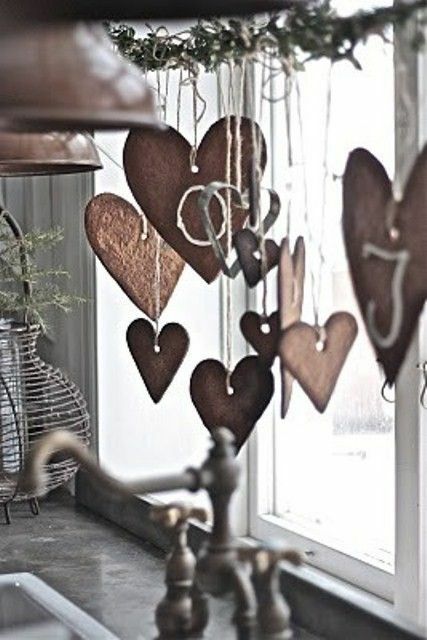 Gingerbread cookies is an another unusual thing you can hang on your window to make your decor looks quite creative. 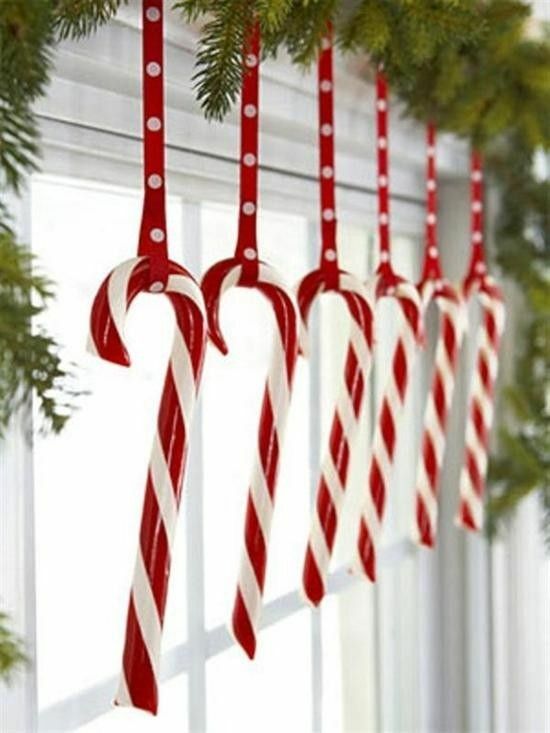 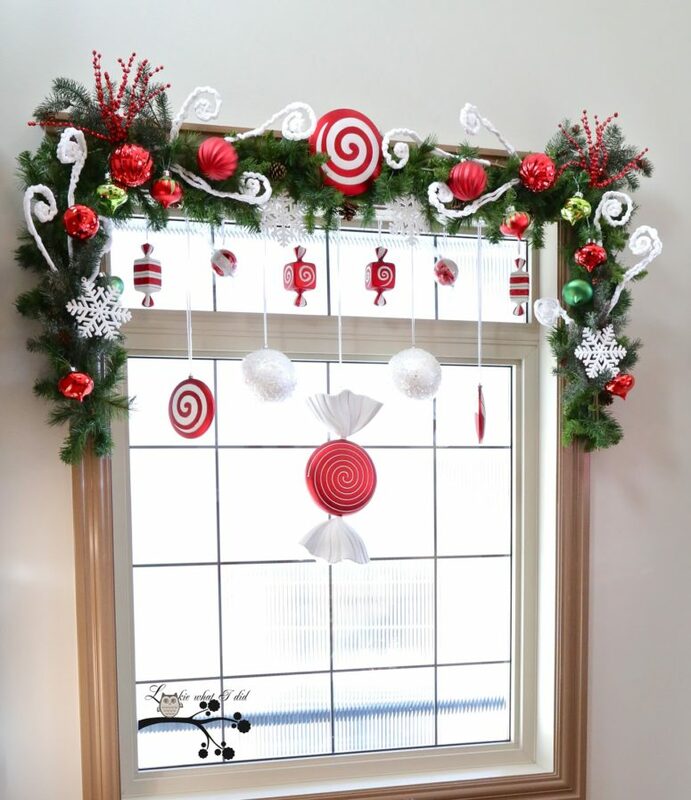 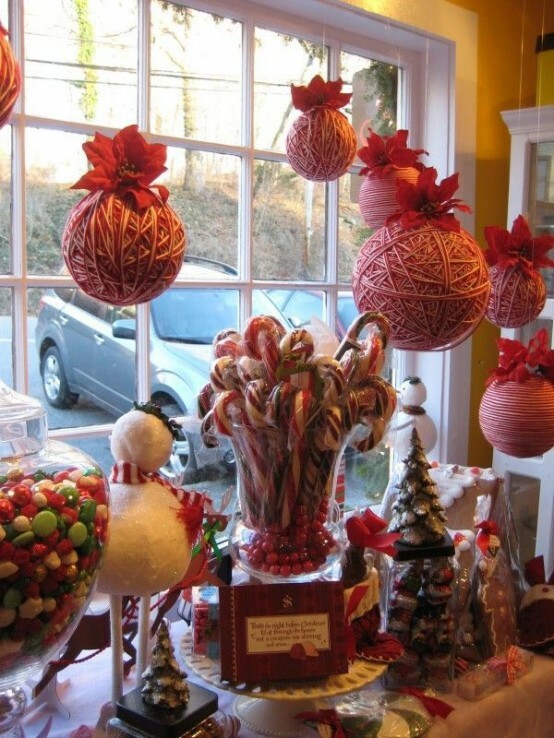 If you're looking for something to hang on your window this Christmas - here is and idea for you....Candy canes! 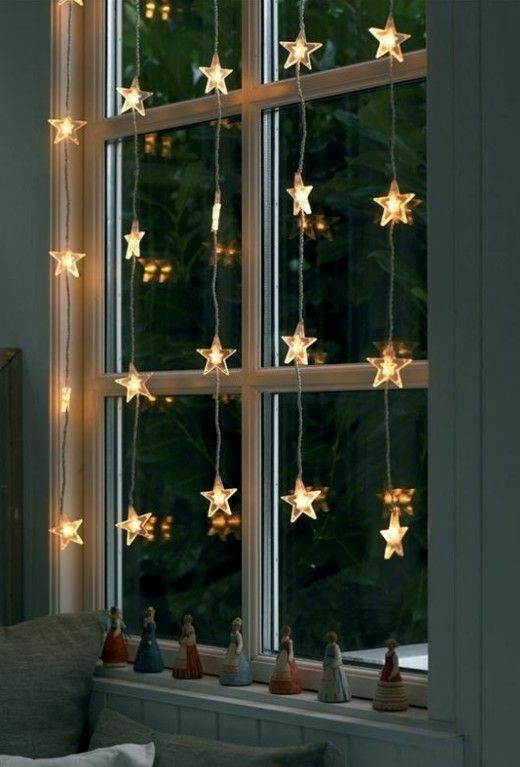 The cool thing about hanging star-shaped Christmas lights on your windows is that they provide some moody light to your rooms and make your house looks gorgeous outside. 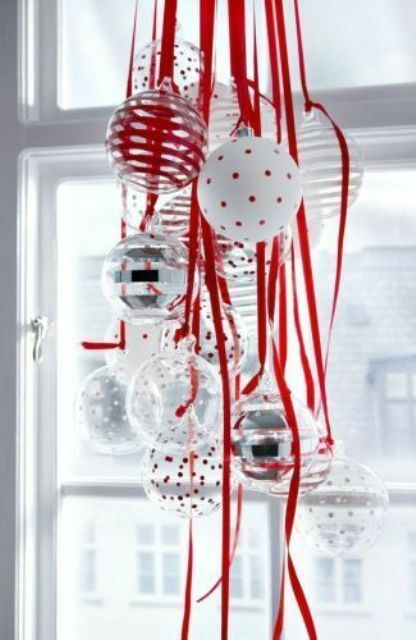 Faux candies in red-white tones would become a great addition to an evergreen swag topping the window. 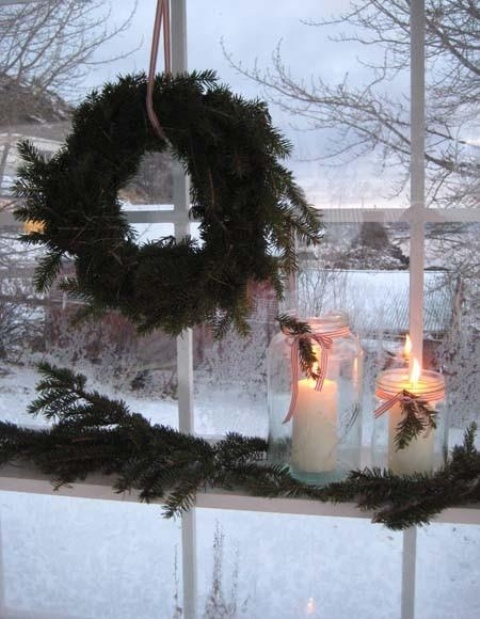 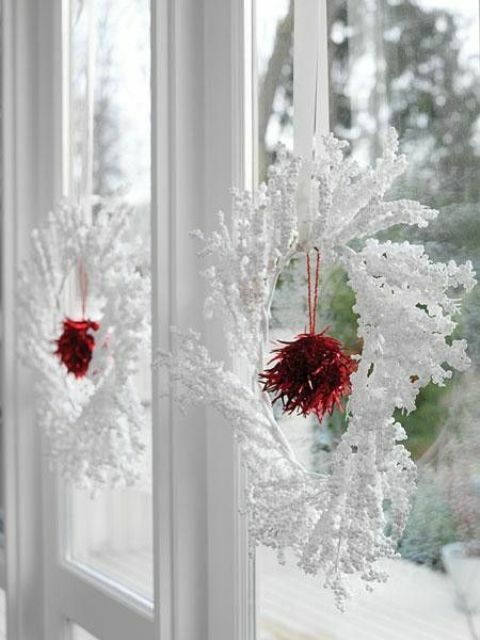 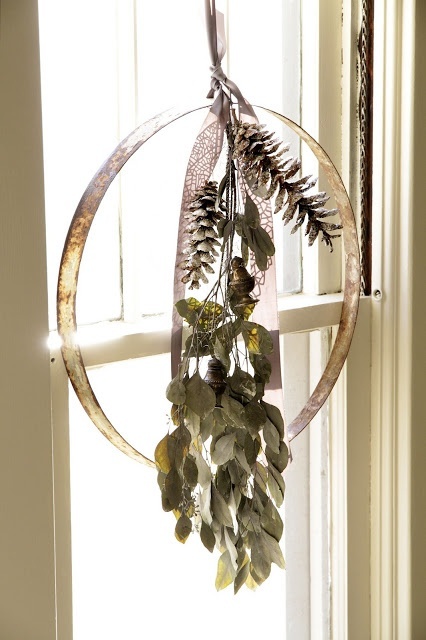 Several hanging wreaths would make a striking impact on your window's look. 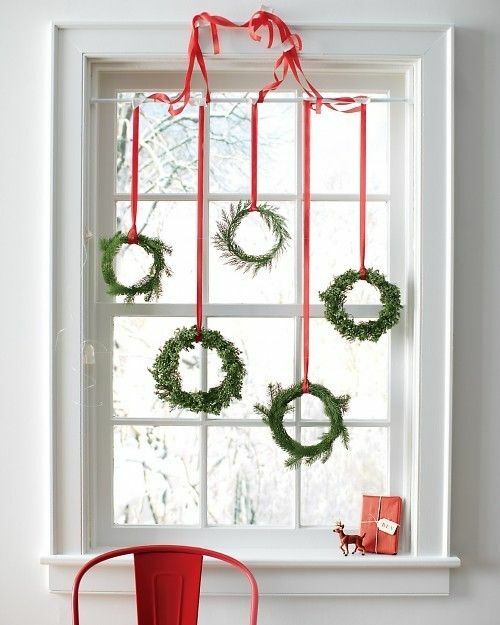 Classic Christmas wreaths looks better in multiples, especially if your window is actually a combination of several windows. 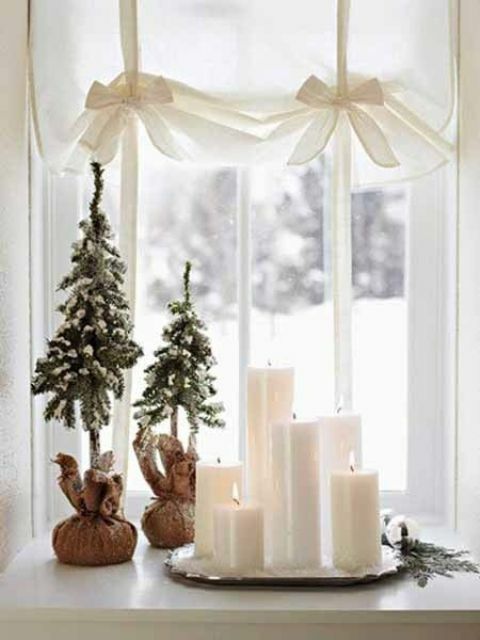 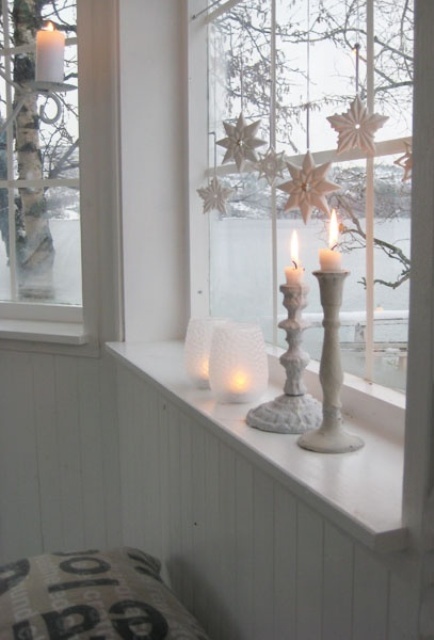 A bunch of candles and several little faux Christmas trees covered with faux snow would look great on any windowsill. 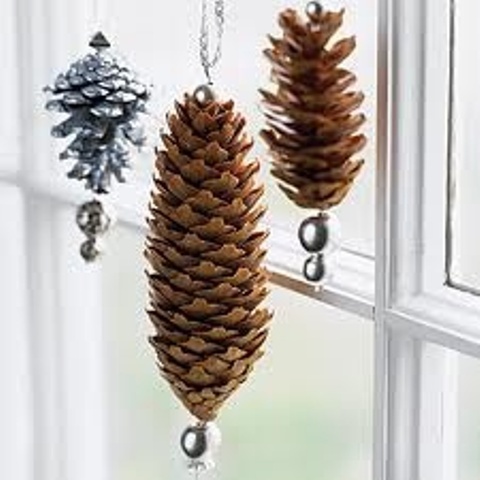 Pinecones are great for different kinds of Christmas decorations and looks especially good on hung from an evergreen swag framing a window. 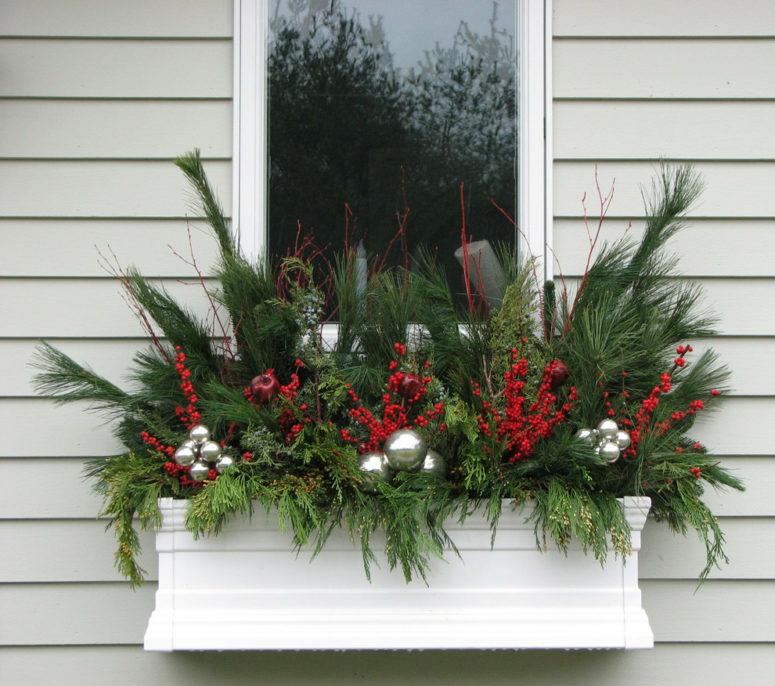 Fill a flower box with holiday decorations like evergreen twigs, berries and ornaments. 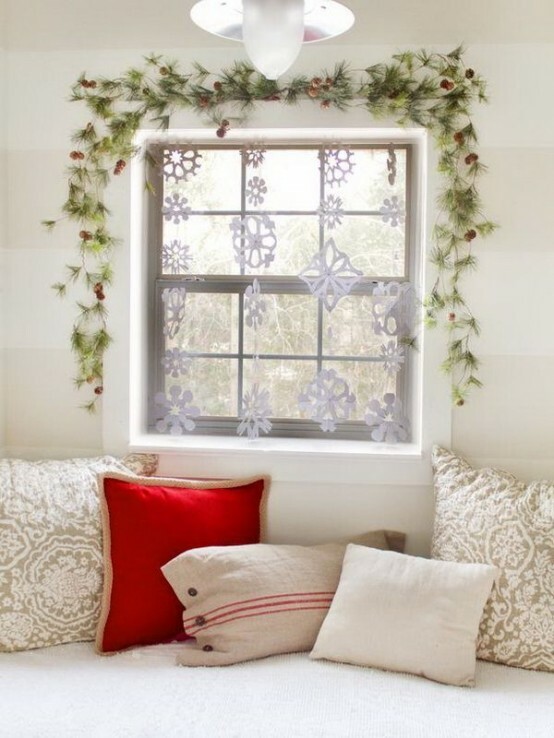 Hang decorative snowflakes in red tones and add an evergreen swag on top of the window. 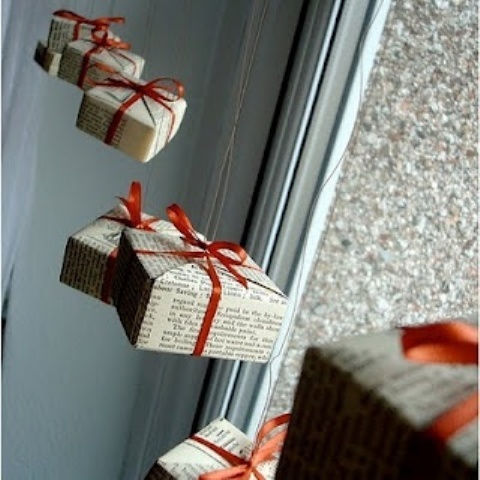 For a vintage, rustic touch cut something cool from old newspapers and hang it on a window. 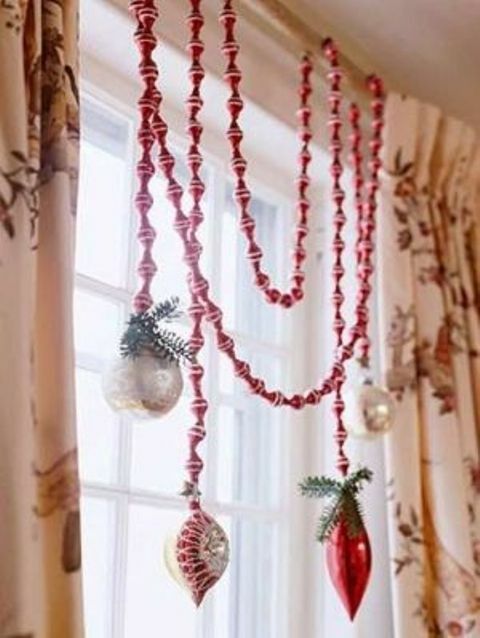 Nothing could be simpler than to hang ornaments on a curtain's rod. 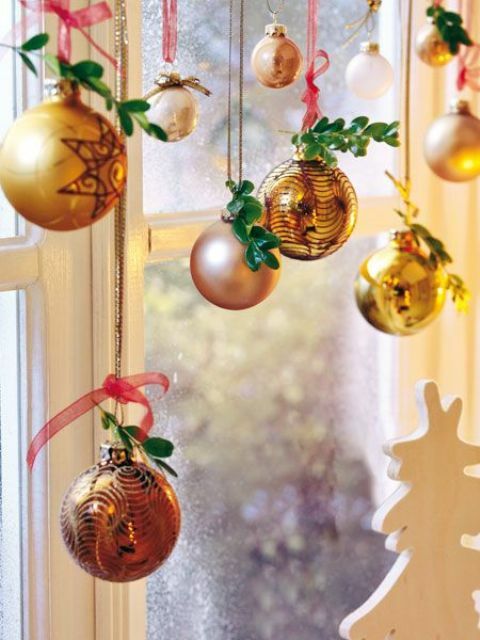 Just make sure to use the same ornaments you're using for the Christmas tree. 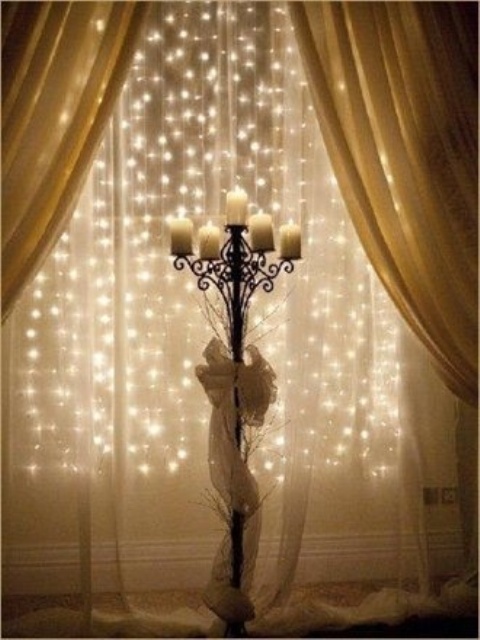 Your decor would be much more sophisticated this way. 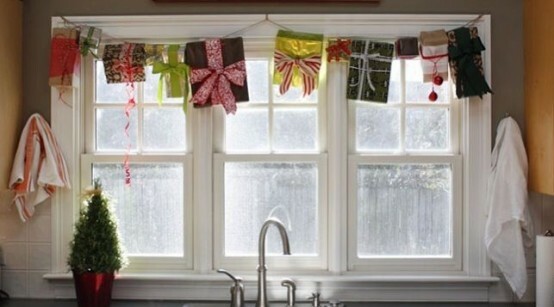 Make a garland of old Christmas presents and fix it on top of a window. 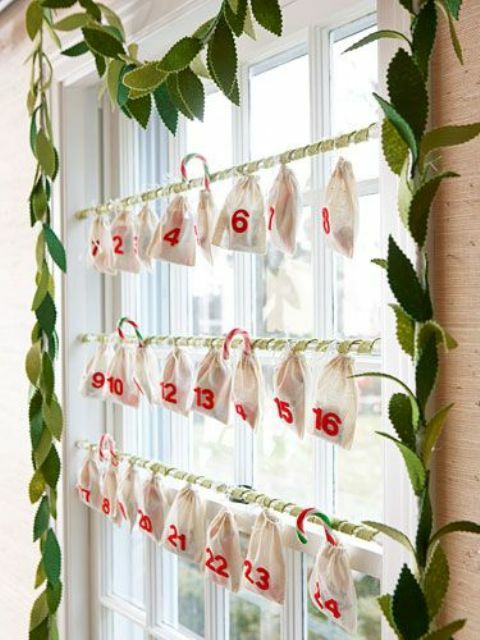 Turn your window into an awesome advent calendar. 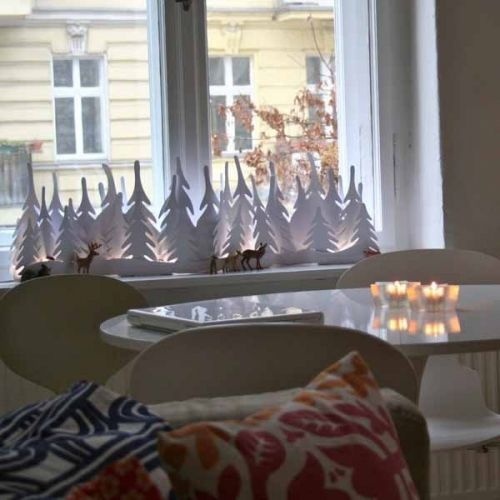 That will make the waiting much more fun. 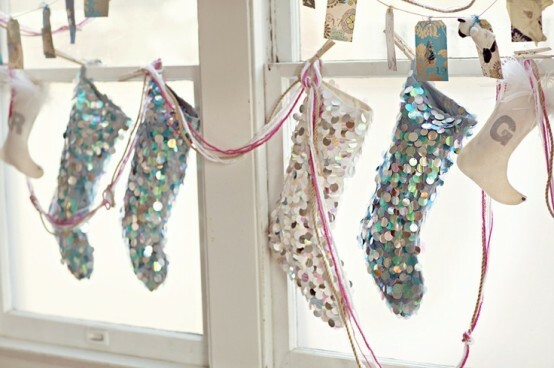 If you don't have a mantel, a window might become a great place to hang Christmas stockings there. 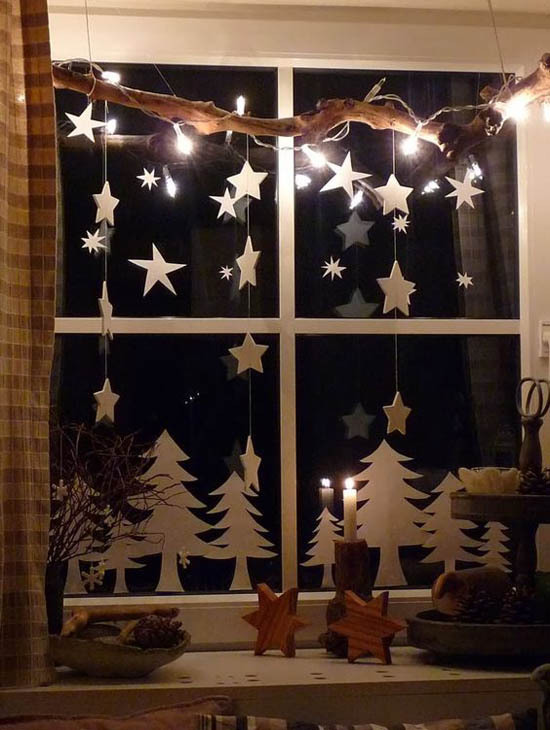 Don't forget, you can decorate your windows outside too.